When I heard that I’d be playing alongside a percussion player for In The Heights, I had visions of a simplified drum setup with minimal program changes to worry about. This was a short-lived dream, however, as the drum part has plenty of incidental percussion and various electronic and sampled sounds that needed to find a home on my kit. In the end, this turned out to be my largest kit yet thanks to a Roland TMC-6 trigger-to-MIDI converter that provided 6 additional trigger inputs (and at least that many headaches). Read on for all the fun details! The Broadway show and cast recording are supported by percussionists Wilson Torres and Doug Hinrichs and drummer Andres Patrick Forero. The “Tour” score that we are working from calls for just two players and, comparing the score to what I hear on the cast recording, I can’t really tell what they cut out. It seems like they just gave us each 50% more work to do! The key to building my hybrid In The Heights kit was the addition of a Roland TMC-6 trigger-to-MIDI converter. The TMC-6 provides 6 additional trigger inputs that are converted to MIDI signals received by the TD-30. The TMC-6 uses the same V-Drum triggering technology as the TD-30 so setting up the triggers was a familiar exercise and the feel of the pads was the same as plugging directly into the TD-30. The TD-30 has a background Percussion Kit on MIDI channel 11, and is what I set the TMC-6 to broadcast on. Once I started customizing the percussion kit for the extra triggers, the learning experience started. I’ve put a few notes in a separate post, for those of you that want all the gory details: Roland TD-30 + TMC-6. Even with the issues I noted, the TD-30 + TMC-6 has proven to be a solid solution to building a bigger, faster, stronger kit for this show. As usual, I started my setup by listening to the cast recording and searching the TD-30 default kits for a good staring point. I settled on the piccolo kit (#47) and got to work customizing it. My first step was to dampen the toms and kick. The toms sound great by themselves, but ring out far too much for a performance setting, especially if there is any reverb added by the house PA system. I was having trouble taming the kick until I turned off “Kit Resonance”. This is a nice touch to add some realism (similar to “Snare Buzz”) but it made the kick very uncontrollable. I ended up with “Felt 1” damping on the toms a “Blanket” in the Kick making for a nice tight kit. 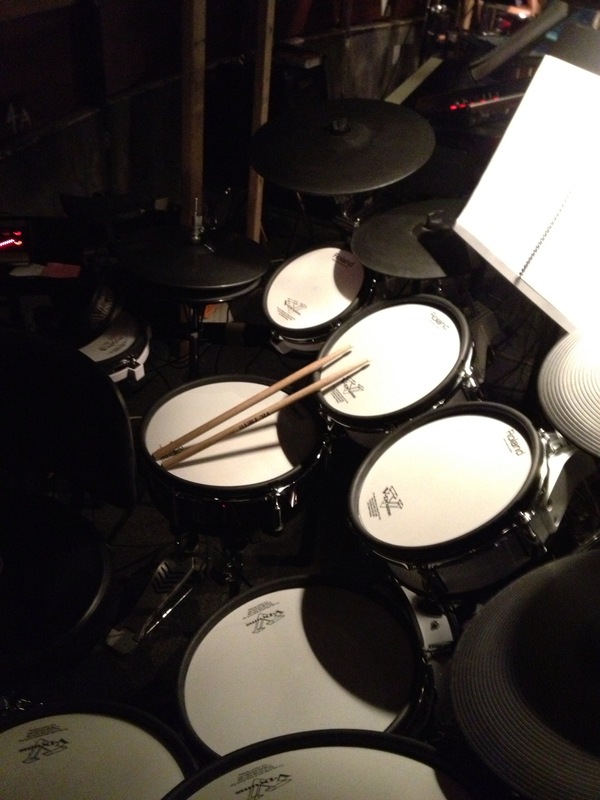 In The Heights called for an assortment of snare drums adding piccolo and soprano snares to the base kit. My go-to snare has been the TD-30 “Stainless Steel” snare (#158). I wish it had editable damping and strainer options but I keep returning to it anyway for its overall sound. Sure enough, the TD-30 piccolo set uses a modified version of the #158 snare, and that it was also the base for my regular snare (stealing the patch from my Legally Blonde kit). The TD-30 does not have a soprano snare so I customized the “Cooly Maple” snare (#198) to create one. Finally, the lively Carnival del Barrio calls for a “Repinique”, which is not to be found in the TD-30. I tried using a Reqinique sample in the Vir2 World Impact Percussion library discussed in my Güira post, but opted for a snares-off version of the TD-30 “Open Brass” snare (#180) to allow better control of rim shots than I was able to get from the Kontakt player. I had an “interesting” first rehearsal of the number 96,000 when, during a moment of silence, our musical director stopped, looked at me and asked “were was the drum solo”? My score showed a bar of cues that matched some electronica in the cast recording that I had assumed would come from the synth player. I took a note, played a lame fill the next time through, and made sure to listen for other sounds / samples that were missing. At home, I went in search of the Dance Hall, Hip Hop and R&B sounds on the cast recording of 96,000. As I was demoing TD-30 kits, I hit a cymbal on the “Hip Hop” kit and heard a familiar sound. The “Philly Hit” patch was a nearly identical match to the sound of that missing “drum solo”. Problem solved! I’d later find out that a number of these missing sounds are marked as cues in *all* of our books, apparently coming from a backing track that we did not use. I mostly don’t tune my drums, mostly. To add bottom-end to the “Dance Hall” section of 96,000, I used the synth “Dancer Kick” patch (#119) but my plan failed when I noticed it was out of tune with the band. It turns out I needed this in 4 different pitches throughout the song. Trying to conserve triggers, I squeaked out 2 notes from one trigger using the Hi-Hat “Pedal Bend” feature to control the pitch of a BT-1 leaving the kick and my left-hand snare to round out the 4 needed pitches. Act I of In The Heights ends with the dramatic Blackout scene. The opening drum part reflects the extremes shown on stage by opposing a high pitched roto tom with a low floor tom. Feeling I could do more than just add a roto tom, I swapped out my 16″ floor tom for its 18″ bigger brother, and used an 8″ roto tom tuned +12 for the top end. I’ve not yet heard this from the house, but I have a feeling I’m giving the PA system a nice workout. I had started with the timbales on my left side and, after struggling with some sticking issues (as in, how the hell did he play that? ), I found a video of Doug, Wilson and Andres playing songs from the show and noticed that his timbales were on his right side, inserted between his two lowest toms. The tables below list the various TD-30 instruments that were assigned to each trigger as I moved through the 42 different program changes needed for this show. 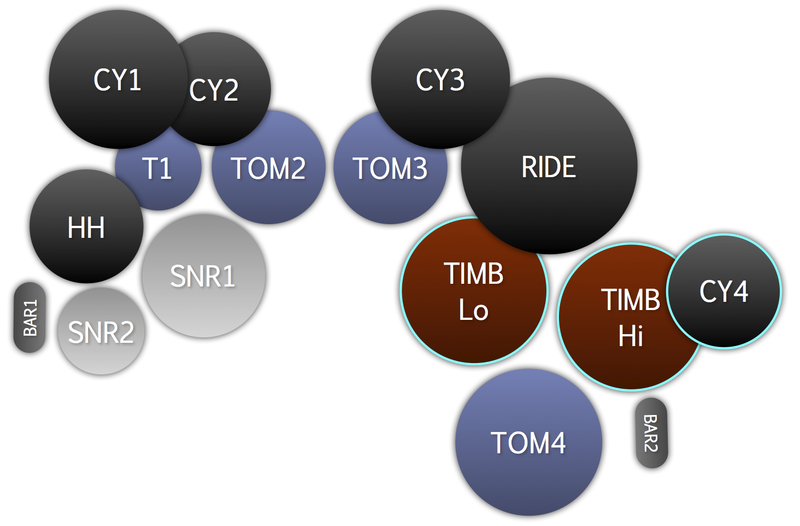 Triggers circled in cyan above were connected via the TMC-6. Post your questions / comments below or use the Contact Page to send me an e-mail.